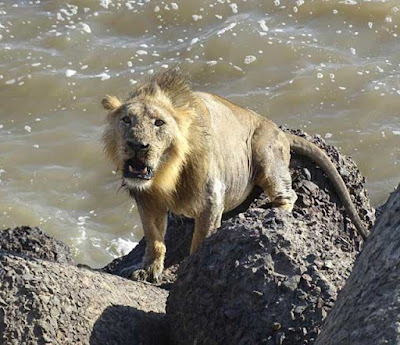 Lions in Pakistan or on the shores of the Arabian sea? 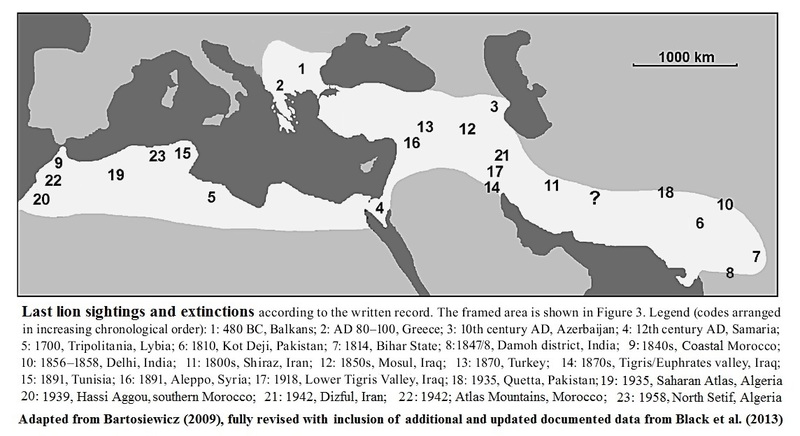 Lions survived in the territories of Pakistan up until the mid 1800s, the last of them believed to be killed in 1842 near Kot Diji in Sindh, so its presence there is essentially ancient history. However there have been recent rumours of lions being spotted in a national park of Azad Jammu and Kashmir, with observers suggesting that these are animals migrating from India. However the lion stronghold of Gujarat in India (particularly the Gir Forest and the Arabian coastal strip) are hundreds of miles south. These unusual sightings may relate to mis-identification of other animals (such as leopards) or, more speculatively, released animals from clandestine captive collections (the latter has been suggested for leopard sightings in Mediterranean western Turkey in the late 20th Century). There have been incidents of illegal trade in live African lions into Pakistan in the recent past; how do you get rid of illegal lions? Could that be part of the explanation? In addition of course there are a number of zoos in Pakistan which have captive Asiatic lions (Panthera leo persica) in their animal collections, although these rare specimens would most likely be kept properly secure. Nevertheless the fact that lions are present in the peninsular of north-western India raises some interesting sightings. Animals from the Gir forest (landlocked by extensive tracts of agricultural land) sometimes have to disperse. By moving across agricultural landscapes and areas of human habitation a small but significant number end up living adjacent to industrial sites, within small coastal forest scrub lands and adjacent to busy ports. The spectacle of a lion walking along a beach or being seen swimming in the sea is, despite its apparently improbability, a matter of fact. Khan, H.N. and Craig, T. (2015) In North-west Pakistan big cats are more feared than global terrorists, The Guardian Weekly/Washington Post 19th September 2015. This entry was posted in Conservation, History and tagged Asiatic, Gujarat, India, lion on January 19, 2016 by Simon Black.